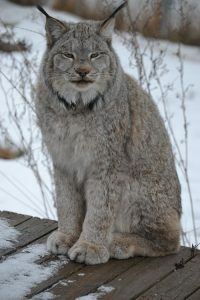 Shalico, a Canada lynx, and his brother proved just how easy it is to buy exotic animals over the internet. Both were purchased through the internet by two college students from a breeder in Montana. Once the college student who purchased Shalico realized it was illegal to own him, he surrendered him to The Wildcat Sanctuary. Shalico was about six months old at the time. Unfortunately, Shalico’s brother had not been surrendered, too. Instead, his brother was seized by authorities from the other college student. We tried to reunite the two brothers, but sadly never heard back from authorities. 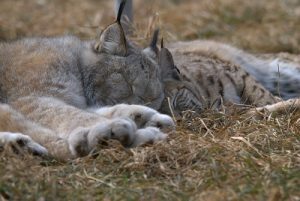 When we called to get a copy of health records, the veterinarian told us the other lynx was very sick and having seizures. Luckily for Shalico, he’s never had any of these health problems. Shalico’s been a ball of energy since the day he arrived. He found companionship with a bobcat named Morgan. She’s been his little shadow since the day they met, and continues to be his little cuddle buddy. We’d hoped Shalico could’ve lived out his days with his brother, but he’s found happiness living ‘wild at heart’ with Morgan. His favorite treats are freeze-dried shrimp treats and he loves rolling around in perfume enrichment! Supporting wild cats for life is an expensive proposition. The veterinary care, nutritious diet they require, as well as the staff to watch over them runs into thousands of dollars. If you would consider helping us by becoming Shalico’s sponsor parent, that would make such a difference! You can sponsor him here.